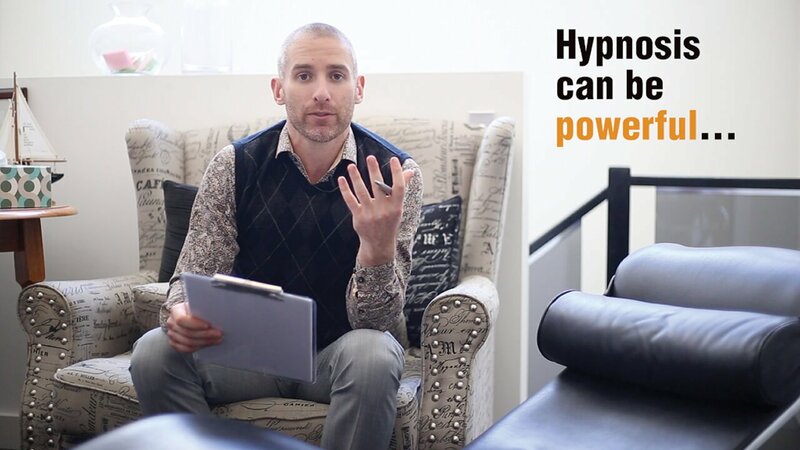 EPISODE 7 What Is Hypnosis and Can It Help Me Lose Weight? In this Thursday Therapy episode, Glenn Mackintosh teaches you what hypnosis is (as well as what it isn’t) and how it can help you with weight loss and maintenance. Hey everyone, welcome to Thursday Therapy. I’m Glenn Mackintosh, the weight psych, and the question were answering today is about hypnosis. Hey everyone, welcome to Thursday Therapy. Before we get too far into it, yes, I got a haircut. It’s just hair, it’ll grow back, it’s totally fine. But we’re here to talk about hypnosis. I’ve been doing hypnosis for probably about eight or nine years now. I find it an extremely effective therapy but it’s also a very misunderstood therapy, so that’s why I’m thankful for this question from Margaret. Margaret asks, “Can you please explain the hypnosis process? I’ve had two people tell me a little bit about it, but I would like a little bit more detail if possible.” Excellent question, Margaret. I’m glad you asked it. I do a tonne of hypnotherapy and I get a lot of people referred to me for hypnosis and I think it’s something that a lot of people see the potential value of and the potential power in from people that they’ve they know or things that they’ve read or they’ve heard about, but you also have a lot of potential misconceptions about what the hypnotic process is. So, first I want to talk you through what hypnosis isn’t and that’ll help you get a better understanding of what hypnosis is. Firstly, we get a lot of our idea of hypnosis from stage or entertainment hypnosis and when I say hypnosis, what I’m really talking about is hypnotherapy, and that’s hypnosis used in a therapeutic context; very different to what you might see in stage or entertainment hypnosis that makes you feel as if the hypnotist is taking control of the person’s mind. Hypnosis is not a process of mind control, it’s not a process that works on your mind, it’s a process that works with your mind and that’s the way we do it in hypnotherapy. Working with the mind of the person for transformations that they want to make. The other thing is hypnosis is not mysticism or magic, I actually began my journey into hypnosis due to the scientific research that hypnosis is an effective treatment for weight management and we’re going to cover some of that research in a minute. So, you might see pictures of Mesma, with his animal magnetism, I think the guy used to wear a cape, and obviously did a lot to popularize these ideas but also probably did a lot of harm and creating some misconceptions about what the process really is about. The other thing is that hypnosis is not brainwashing. Brainwashing typically happens in a real absence of any external stimuli; no sights, no sounds for a prolonged period of time and it’s really designed to change someone’s mind set against their will, whereas hypnosis is generally really, really comfortable for people. So, it’s generally experienced like a kind of a comfortable relaxation that might be a light relaxation or it might be like a deep relaxation or a deep meditative state, almost like sleep, but it’s generally very comfortable and the only transformations that your mind will make, during hypnosis, are the ones that that you wanted to make. Hypnosis is also not subliminal; so, I don’t want you to feel like if you’re doing good hypnosis, like there’s anything outside your awareness, any sites that you can see that you’re your conscious mind won’t register or any sounds that are happening outside what you can perceive, so, you’re not getting any subliminal messages. The final thing I want you to know is that hypnotherapy is not dangerous. If you work with a qualified hypnotherapist and you’re doing proper hypnotherapy, the process for most people is just nice and pleasant process and then, generally, the only surprises that happen are good surprises. So, now you know a lot about what hypnosis is not and I might give you some light hypnotic suggestions that you’ll forget all of your preconceptions about hypnosis. Any of those misconceptions that you had, you will forget and the more you try to remember them the more you will forget into it’s impossible to remember at all, and all you will remember is that your mind is now opened to learning what hypnosis really is. So, what is hypnotherapy? Hypnotherapy is where a person is guided into an idiosyncratic state of awareness, where that person becomes more receptive to ideas that are helpful to them. So, let’s break that down. Firstly, it’s idiosyncratic, which means it’s very unique and it’s a personal experience. I’ve done hypnosis with people where they’ve gone into that cliché, hypnotic trance like experience where they forget that so much time has passed, we might have done a 35-minute hypnosis session and they feel like it’s gone for two minutes and they can’t remember anything that’s happened, but a lot of people that do hypnotherapy with me and a lot of other hypnotherapists, they just experience it like a pleasant, light relaxation. A lot of people will come out of hypnosis and think, “Well I don’t know whether I was actually hypnotized or not” until they then notice the benefits. Also, it’s a state where you’re guided. So, it’s not a state where you’re controlled. The hypnotic process works with you and a good hypnotherapist will understand the best way to hypnotize you as a unique individual. And it’s a state of openness and receptivity to new ideas. So, often in hypnosis we do that through relaxation, but it can be done through focusing, it can be done through a whole variety of techniques and we actually go into and out of trance states quite naturally all the time. You might do it, say, if you’re traveling home from work and you take all of the same paths that you normally take you get home and it’s like, how did I get there? You’re in a trance the whole time you look at the front there’s like no one on your dashboard, there’s no police behind you, but somehow, you’ve just gotten from A to B and you’re in a trance-like state. So, a trance is actually quite a normal state but in hypnosis we’re guiding you into that state for the purpose of suggesting ideas that will be helpful to you. That’s the other thing, when you do hypnotic work, it’s really about being open to ideas that are right for you. The idea is that we’re relaxing or focusing or bypassing your conscious brain to allow ideas to sink deep into your unconscious mind, which is where all of your emotions and your habits and your deeper beliefs sit. So, we’re able to make those changes on deeper levels and the only changes that will happen are changes that are right for you. Your unconscious mind is a very powerful thing and if you hear suggestions when you’re doing hypnotherapy that aren’t right for you, your mind will just say, “No I’m not ready to take that one on yet or ever” and the ideas that will be right for you will sink deep into your mind. So, that’s what hypnosis is and I might give you some light hypnotic suggestions that your understanding of hypnosis will sink deep into your subconscious mind that idea that hypnotherapy is where a person’s guided into an idiosyncratic state of awareness where they become more receptive to ideas for change that are helpful to them, as unique individuals, that’ll sink deep down into your subconscious mind. So, now that we know what hypnosis isn’t and what hypnosis is, let’s answer the question, “Can hypnotic work help me with weight management?” Well, if we look at meta-analyses, which are groups of studies analysed together, the answer is yes, it can. So, if we start off with weight loss, what we know is that compared to diet and exercise and compared to cognitive behaviour therapy or ‘CBT’ which is the current psychological gold standard for weight management, people who do hypnotic work lose significantly more weight. Now, that’s interesting and that’s exciting and people do get really excited about weight loss but what we all know is that the name of the game is really long-term change and let’s then turn our attention to a meta analyses that looked at the addition of hypnotic work for long-term weight management. So, if we see people doing cognitive behaviour therapy, they tend to lose some weight and then slowly regain the third of the weight. Cognitive behaviour therapy is actually one of the best ways to slow the regain of weight that comes with weight loss but there is still this regain, which is obviously not great. If we add hypnotic work on to that therapy, what we see is a bigger weight loss which again, that’s great, that’s exciting, but the most important thing is what we see is when the treatment finishes, the people then continue to lose more weight which is really interesting because what we always find with every treatment, apart from bariatric surgery, is that post treatment people begin to regain weight but when hypnotic work is included in these studies they actually continued to lose only a little bit but they continue to lose weight after the treatment finishes and this fits perfectly with the theory of hypnosis because the theory of hypnosis is that you’re creating subconscious changes that don’t require that conscious effort and that conscious attention to maintain that makes sense that the change is last longer. So, I might give you some light hypnotic suggestions that you will understand that hypnotic work can work for you and if you find the right hypnotherapist for you then you will find that the results will be surprising and not only will the results be surprising the results will also be amazing and you’ll be surprised and amazed at how hypnotic work can work for you. So, obviously I’m a massive advocate of hypnotherapy but if you’re looking to do hypnotherapy how do you find someone that’s right for you? Well, the first thing is I’m not sure about other countries but in Australia, unfortunately, hypnotherapy is not regulated. So, there’s no governing body which registers hypnotherapists so what I like to do is go with a psychologist who also does hypnotherapy, that way the psychologist is bound by the psychologists code of ethics which includes; do no harm and includes they must be effective with you to continue practicing so that way you’re going to know that you’re not going to get any harmful hypnotherapy from someone who isn’t qualified and you also know that if it’s not working for a few sessions, sometimes it takes a little bit to figure out the best way of hypnosis to work for you, then if it’s not working then the psychologist will discontinue the therapy. The other thing is it’s important I think to work with someone who you have a good relationship with, who you have a positive feeling towards and a trust, often hypnotherapist will talk about doing the dance of hypnotherapy, it’s an interaction between you two, so the more you trust and the more you have a positive feeling towards and the more you like the person doing hypnosis with you, the better it will tend to work. If you can, as always I’m going to advocate for non-dieting, try to find hypnotherapists who work from a non-dieting perspective, so if you see a hypnotherapist that is saying “lose weight fast” you know all those gimmicky type of things or diet focus type of things, I would try and steer away from someone like that. I will give you guys a really special offer I’m going to give you an offer to try my relaxation and affirmation CDs so this is a set of hypnotic CDs that I’ve developed around weight management. The idea is that it’s seven different sessions with me, so I want you to consider that you’re on the couch, and what we go through is the seven key mindsets for long-term transformation with your weight. So, we start off with mindfulness. I’m giving you suggestions that you’ll be strangely aware of your eating and your drinking and your movement. Then we move to motivation, so you know sometimes you have that sort of burning desire and you really just want something, I suggest that you’ll have that kind of feeling for taking care of yourself. Then in the third session we move on to perspective and I suggest you that you’re just going to develop a more positive attitude, it’s going to be easier for you to eat well, easier for you to move regularly, easier for you to drink well and stay hydrated, just because you’ve got a positive attitude. The fourth session that we do in relaxation and affirmation is around balance and creating a process is not strict dieting and not overeating, just a nice middle ground, same with your exercises, you’re not going to go gung-ho crazy and then go to being completely sedentary you’re just going to have that nice middle ground you can sustain forever. Always with everybody I see, we want these results too quickly and you’re probably like this we naturally want that in the dieting industry conditions us to want things more quickly, so the next session is on developing patience and I suggest to you that you’ll just be really happy with small changes and you’ll stay motivated and over time those small changes will transform into really big changes. In the sixth session we work on persistence, setbacks are a part of this process, so I talk you through the really adaptive positive way to view setbacks, when you have them you’ll just view them as part of the process of making progress and the learning experience for you and you’ll just learn from them, so you have fewer and they’re further in between in the future and then in the final hypnotic session I suggest you that you’ll be really confident. You might have been confident before but have a bit had a false confidence based on a dieting mentality or a confidence based on temporary changes but what I suggest is because you’ve made those other six mindset transformations that you can have a real confidence that “yeah this time I’ve really transformed my mind and I’ve really got this”. So, if you want to do that, you can use the discount code ‘GMACK’ and get ten percent off that resource. It’s really cool resource, people really, really like it and there’s a whole lot of info in that the link there, so if you’d like to do that, it can be a really good way to dip your toes into the world of hypnosis. If you’re still not yet convinced you can even listen to those sessions you know while you’re watching the telly or while you’re reading a book or makes a note start just so you know exactly what I’m saying and then you can delve into it like a more relaxing experience. So, guys thank you so much for listening to this Thursday Therapy. I hope it cleared up some ideas around hypnosis, as always if you know anybody, there are a lot of misconceptions about the hypnotic process, so if you know anybody that would help to learn more about hypnosis, please share this video with them and of course if you haven’t already please subscribe and I’m going to really look forward to seeing you in a couple of weeks at our next Thursday Therapy. Until then make sure you have a hypnotic time. Hey Buddy!, I found this information for you: "EPISODE 7 What Is Hypnosis and Can It Help Me Lose Weight?". Here is the website link: https://www.weightmanagementpsychology.com.au/episode-7/. Thank you.